The Conservative War Chest is a “Call to Action” of the American people, by the American people, and for the American people to restore and to re-establish the important discourse the Founding Fathers and the Constitution intend in the Congress – and, in particular, the ability the United States Senate to function as the Founders intended by removing the current majority leadership and their blockade of the Congress and the vital interests of our Nation by electing in 2014 a Republican majority. The Conservative War Chest is composed of concerned Americans in every State who will give of their time, talent and treasure to work in their respective states to elect and re-elect conservative Senators in order to establish a Republican majority the United States Senate in the 2014 General Election. Such a result will enable that body to operate in comity within itself and with the House of Representatives to serve the American people as the Founders intended. The members of the Conservative War Chest will aggressively engage in both (i) grassroots through the volunteer chapters in each State and (ii) media to thwart the smear tactics of liberals and turn their smear ads into a liability for their candidates. 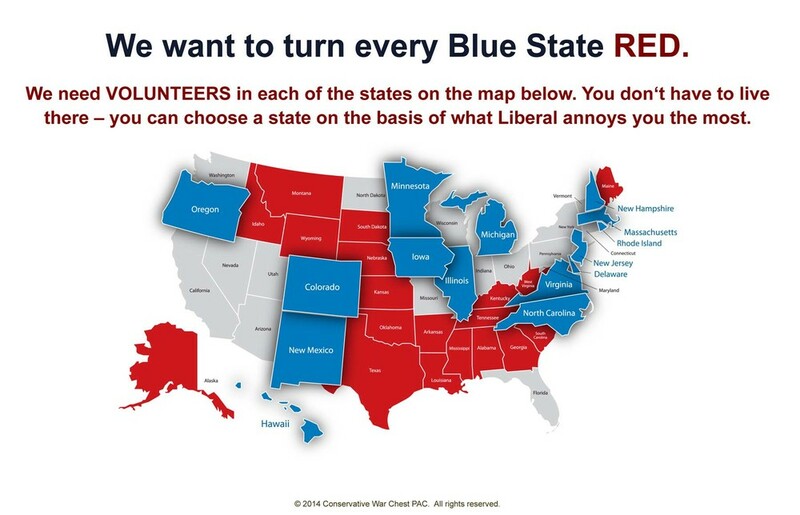 We will run ads throughout these States to keep elections focused on the kind of conservative vs. liberal issues that led to Red State victories. Please use the form below to sign-up for future correspondence from Conservative War Chest. “Freedom is never more than one generation away from extinction. We didn't pass it to our children in the bloodstream. It must be fought for, protected, and handed on for them to do the same, or one day we will spend our sunset years telling our children and our children's children what it was once like in the United States where men were free." President Ronald Reagan. We have an obligation to encourage our fellow citizens to engage with their time, talent, and treasure to fight for and protect our freedom for the sake of our children and our children’s children. Continuing US energy dependence upon foreign oil by frustrating development of America’s own natural resources on public lands and blocking development of the Canada-US pipeline to bring additional oil from our neighbor nation, resulting in a continuation of gasoline prices at twice the level per gallon in 2008. Our Nation Needs You! The Conservative War Chest Needs You!!! Save the ability of the Senate to function as the Constitution intends, and, thereby, restore the vitality of the Nation’s Congress and its ability to address the critical issues of our time.